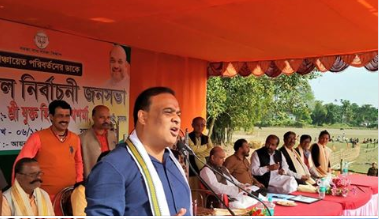 Senior BJP leader and Assam’s minister for Health, Finance and PWD, Dr Himanta Biswa Sharma on Thursday stated that he won’t be in the arena of active politics in Assam after the year 2021. He sad so while addressing a massive BJP party rally at Sarusajai National Games stadium here. The BJP leader has been most vocal on behalf of the party in auguring for the controversial, Citizenship (Amendment) Bill, 2016 that has triggered vociferous mass protest in Assam and rest of the Northeast. He lambasted the section of intellectuals who have jumped on the bandwagon of protest against Citizenship (Amendment) Bill but remained silent when ‘Satras’ in Assam were encroached upon and a 50-year-old woman was raped at Jamunamukh in Nagaon district of Assam. It may be mentioned that the minister himself faced black flag protests on a couple of occasions in the state while may organisations that are up against the Bill have targeted Himanta Biswa Sarma along with the Chief Minister, Sarbananda Sonowal for advocating in favour of the Bill. Former Assam chief minister and Congress veteran, Tarun Gogoi terming Himanta Biswa as ‘Hindu Jinnah’ accused him of trying to engineer Hindu-Muslim clashes in Assam.